Yes, this is a Dacia Sandero. Dacia have decided that given the lack of potential demand all their cars, whether the Sandero or anything else, are to be made as manuals only and are going to remain that way. They can therefore reduce their production costs by not spending money providing an option which few buy. 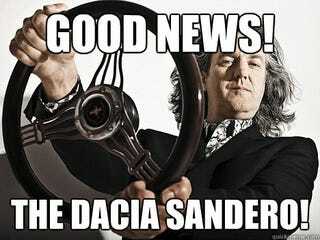 It may be realised from this that Dacia don’t sell in North America or Japan.